For applications requiring measurement of low-power, high-power or energy of continuous or pulsed light sources, Newport models 1935-C/2935-C and 1935T-C/2935T-C instruments have broken the barrier of temporal measurement performance with calibrated results. This series of power/energy meters have the ability to handle repetition-rates of up to 10 kHz at a sampling rate of 250 kHz. 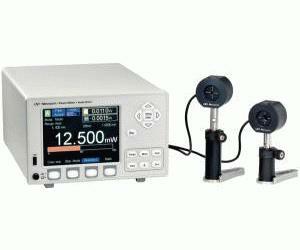 Pulse, peak-to-peak and DC source measurements can be displayed in units of W, dBm, dB, J, A, and V. Simultaneous measurements of a variety of light sources operating at different power levels and wavelengths can be performed with our Dual-Channel 2935-C and 2935T-C Series Optical Meters. Low-power measurements, of pW to several Watts can be accomplished with any one of the Newport 918D Series Silicon (Si), Germanium (Ge) or Indium Gallium Arsenide (InGaAs) Detectors, covering 190–2550 nm wavelengths. The 918D Series includes the model 918D-IG-C1 Detector with a built-in Peltier cooler, designed to work with models 1935T-C and 2935T-C Power/Energy Meters. The internal TE cooler drive electronics featured in these instruments replace an external benchtop driver, providing a more economical and space-saving solution. All 918D Series Detectors have a built-in temperature sensor utilized for sensing and actively compensating for temperature-induced measurement fluctuations. High-power measurements, in the 1 mWatt to 20 kWatt range can be performed with the 1935/2935-C Series meters utilizing thermopile detectors. The Newport 818P Series Thermopile Detectors, operating in the 0.19-11mm wavelength range, can be utilized for these measurements. Energy measurements of pulsed laser sources, from 7 mJoule to 20 kJoules can be taken with these meters, using pyroelectric detectors. Pulse repetition rates from single shot to 10 kHz can be measured directly without having to rely on oscilloscope measurements. The Newport 818E Series (Energy Detectors) Pyroelectric Detectors, operating in the 0.19–20 mm wavelength range, are fully compatible with these instruments. True Root-Mean-Square (rms) measurements, providing the most accurate rms value regardless of the shape of the input waveform. Advanced features include user defined display colors, an internal 250,000 data point storage buffer, additional data storage using an external USB flash drive (memory stick), analog and digital filtering, programmable sample rates, moving statistics, plotting and multiple user-configuration storage.